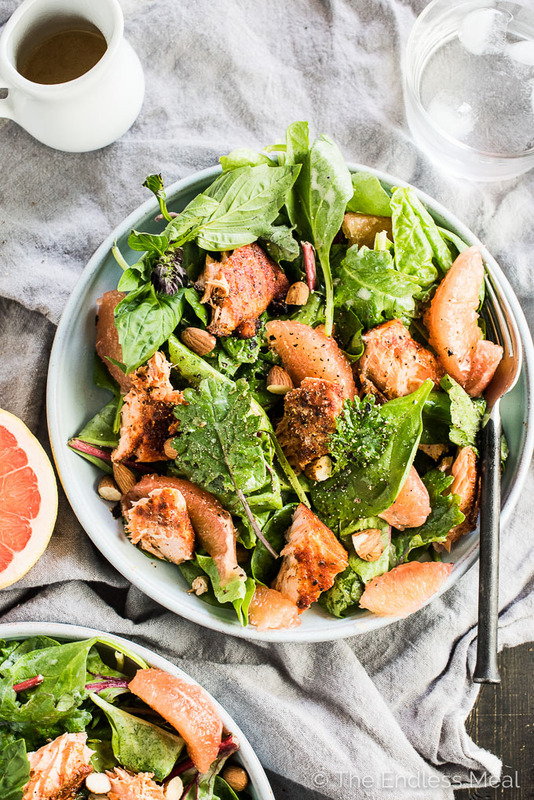 This fresh and tropical Grilled Salmon Salad is as delicious as it gets. 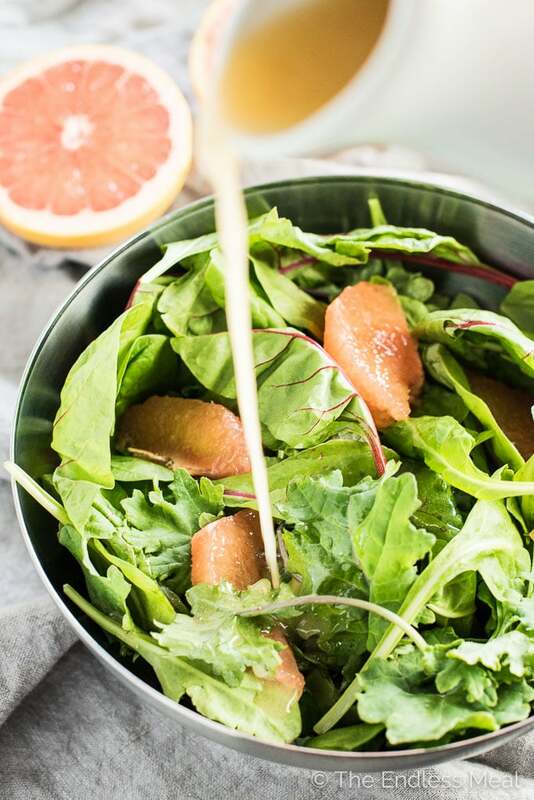 Toss your favorite spring greens in a grapefruit coconut salad dressing and top with bites of grapefruit, chopped almonds, a little dill, and spicy grilled salmon. 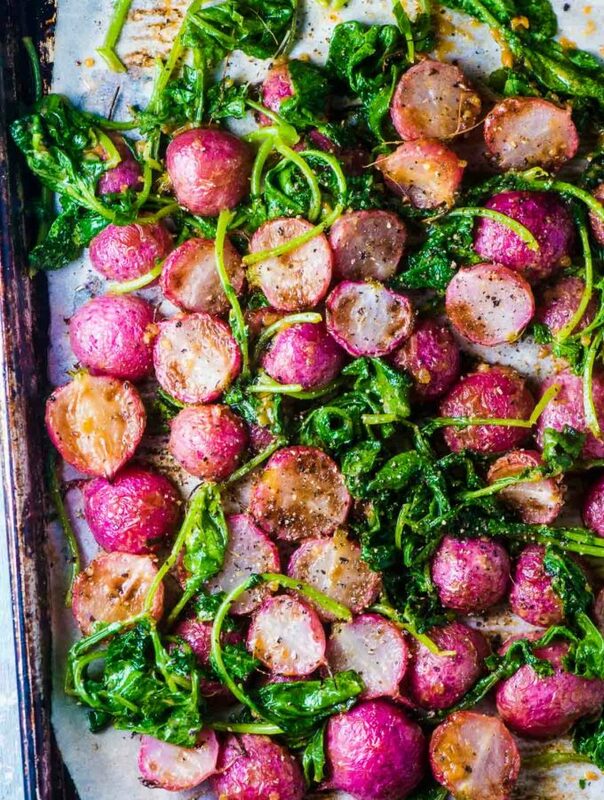 It's a healthy lunch or dinner recipe that is gluten-free + paleo + Whole30 approved. It's time to open up our BBQs and let that sweet smoke fill the air. Is there anything that says summer is here more than the first smell of BBQ? You might be able to tell from that glass of water in the picture, that I'm still on The Whole30 Program. If I wasn't, that would be a glass of chilled white wine instead. 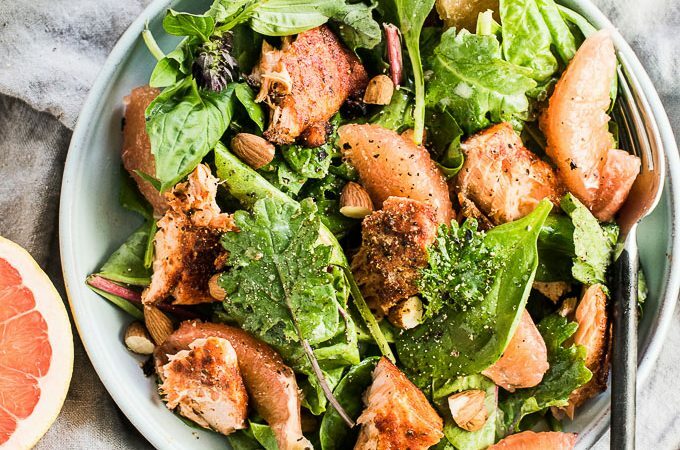 Even though this Grilled Salmon Salad is 100% healthy for you and Whole30 approved, I'll be eating it all summer long. With wine. Man, I can't wait to have a glass of wine. One more day to go. There's something about the spicy barbecued salmon and the sweet and slightly tart grapefruit that totally makes sense. I was shocked how well they go together. Then there's the light coconut flavor in the dressing, the crunchy almonds, and the fragrant dill. Everything blends together to create a healthy lunch recipe that is D.E.L.I.C.I.O.U.S. Question for you … do you also see Mother's Day written all over this? It's all I can see. ? What are you doing for your mom for Mother's Day? I'll be FaceTiming with my mom and wishing we were spending it together. I so wish my mom and the rest of my family lived closer to me. Now that I'm a mom too, being away from them is extra hard. Maybe one day I'll convince them to move to the city. If this sunshine keeps up, my handsome man and I will spend Sunday picnicking with his mom and family. My vote is to find a beach and set up camp for the day. With this Grilled Salmon Salad, of course. That's the other thing about this salad … it's totally packable. 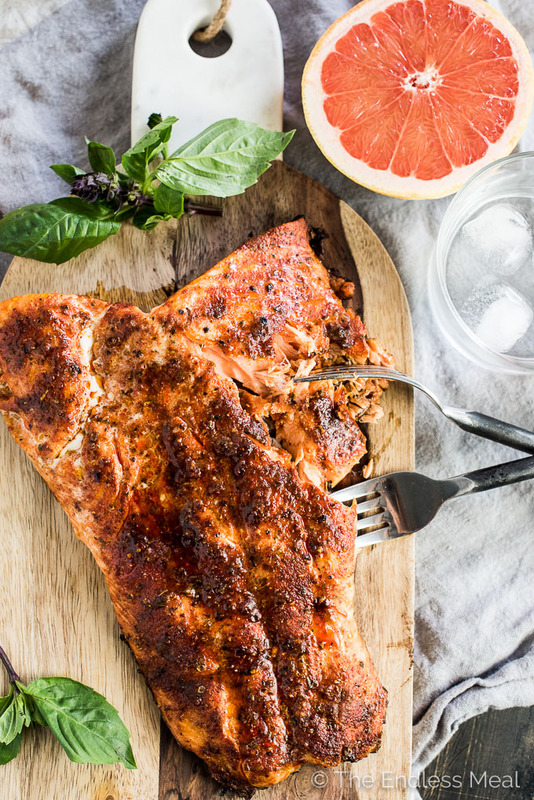 The salmon is as incredible cold as it is hot off the grill. If you pack the salad then pour the dressing over just before you eat it, you can take this with you to work, on a hike, or on a picnic. This is the last day of my Whole30 adventure. I'm not going to lie, I'm pretty excited for it to be over. I'm not even entirely sure that I want to eat any of the restricted foods, but I tired of being told what to do. Ok ok, I definitely do want to have a glass of wine. That's the truth. I'm buying steaks and a bottle of my fav red wine for tomorrow. It's time to celebrate. 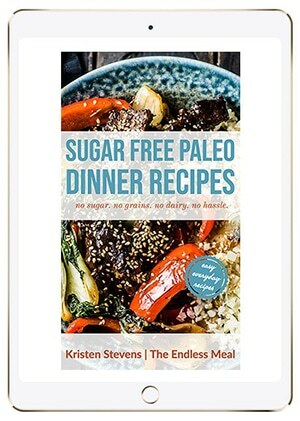 Have you made any of the Whole30 approved recipes that I've posted over the last month? Did you know they were all Whole30? I'll be sharing all the nitty gritty about my experience with the program in the next blog post. Warning: it might be a long one! 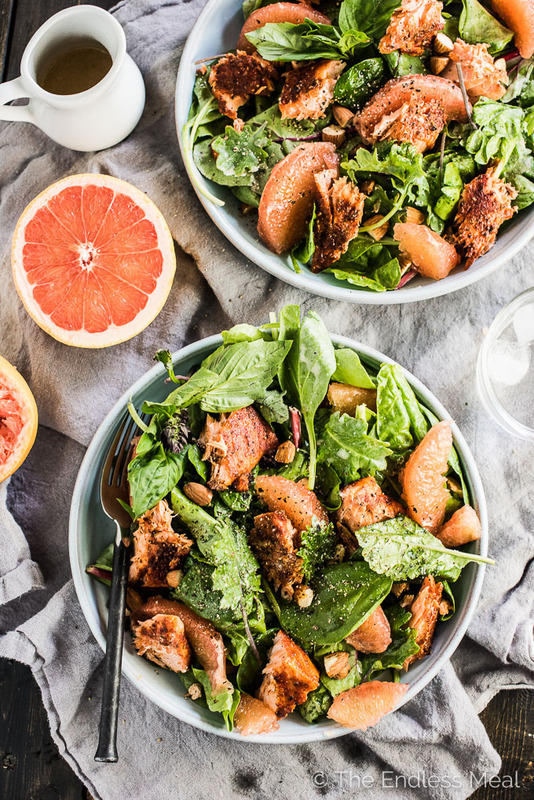 If you make this Spicy Grilled Salmon Salad with Grapefruit and Coconut make sure you snap a pic and tag #theendlessmeal on Instagram so I can like and comment on your photos. I love seeing TEM recipes you create! Oil your grill and preheat it to medium-high. Using a sharp knife, remove the skin from the salmon. (You can ask your fishmonger to do this or remove the skin after the fish cooks if you're not comfortable removing it first.) In a small bowl, combine the sea salt, paprika, cayenne, oregano, cumin, and black pepper. Sprinkle evenly over the salmon. Grill the salmon for 6-7 minutes, or until just cooked. If white spots start to appear on your salmon, remove it immediately as it is done. Let it cook slightly then break it into bite-sized pieces. While the salmon is cooking, whisk all the dressing ingredients in a small bowl. Toss the greens with the dressing and serve with the grilled fish and all the salad toppings. Why would you remove the skin? 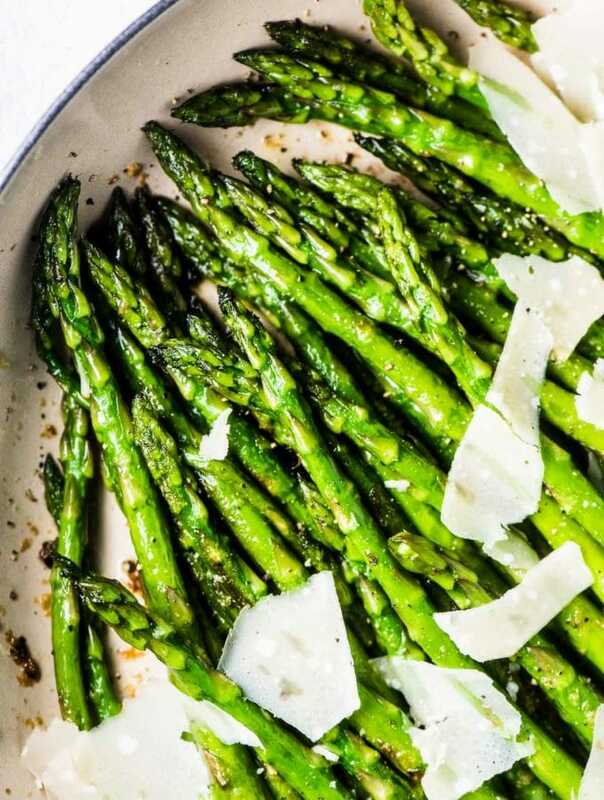 Cook it till it’s crispy and crunch shards of it over the salad! Unfortunately, I can’t eat grapefruit – which is such a shame, because I love it – and I bet it’s fantastic with salmon!